On August 15, at approximately 5:00 p.m. David Wilson became the first dealer in history to sell 500,000 (yes, that is half a million!) Toyota/Scion/Lexus vehicles. 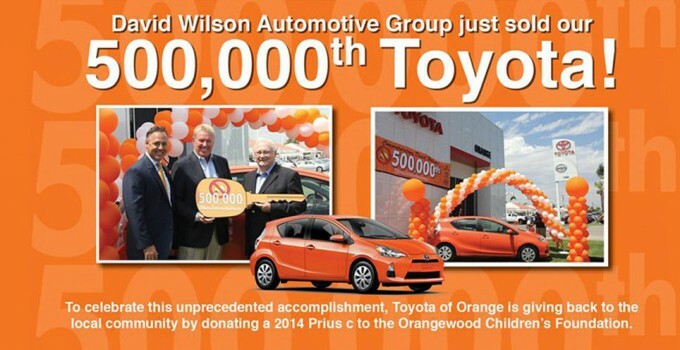 In typical fashion, Wilson celebrated by DONATING the 500,000th car, a Habanero Orange Prius c, to Orangewood Children’s Foundation. The Prius will be used to benefit the Children’s Trust Fund, which provides college scholarships to former foster youth. The David Wilson Endowment Fund at Orangewood was established to also provide college scholarships to former residents of Orangewood who might not otherwise be able to afford a postsecondary education. This historic milestone comes in the midst of an outstanding year of sales for the Wilson Automotive Group. Toyota of Orange alone has already sold more than 5,000 vehicles in 2014 and has seen a 33% increase in sales over 2013. The observation was made that if 500,000 vehicles were stretched end to end, they would reach 1,700 miles – or almost exactly the distance from Toyota of Orange to David’s birthplace of Traer, Iowa. 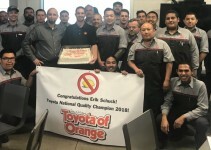 Half a million cars also indicates that a Wilson dealership has sold a new Toyota, Scion or Lexus every half hour for the past 30 years – quite an accomplishment.